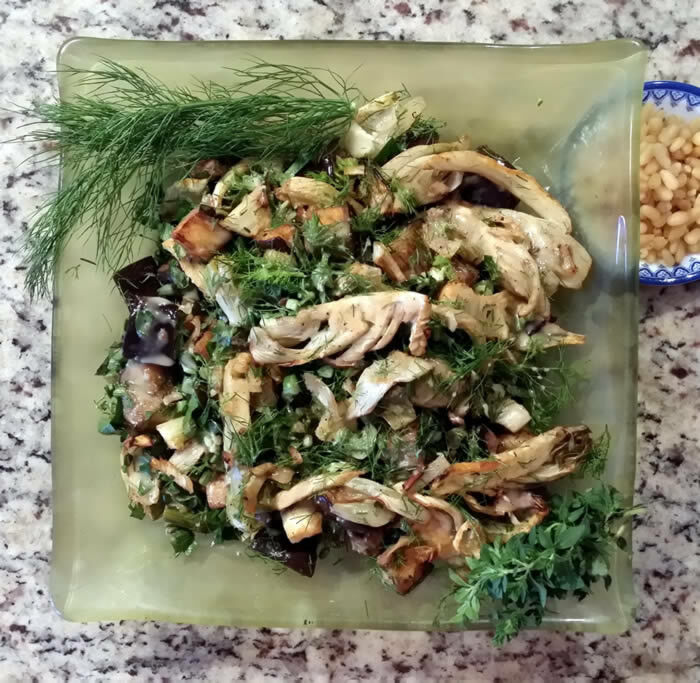 Fennel has quite a delicate flavour which can easily be overpowered in cooking with stronger flavours, but this recipe really allows the flavour to come through and is great combined with eggplant which takes on the other flavours in the dish. I’m not a fan of pine nuts, so prefer to serve them separately (if at all), although the dish does look better if you sprinkle them on top when serving. 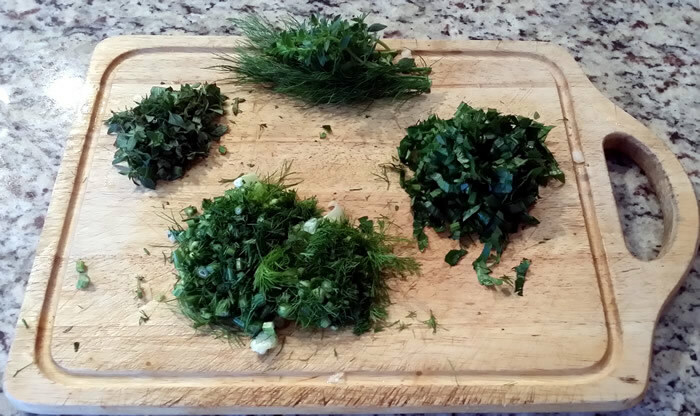 I used spicy oregano, parcel and the fennel fronds, but any of your favourite herbs can be used. This dish can be served warm, at room temperature or chilled. 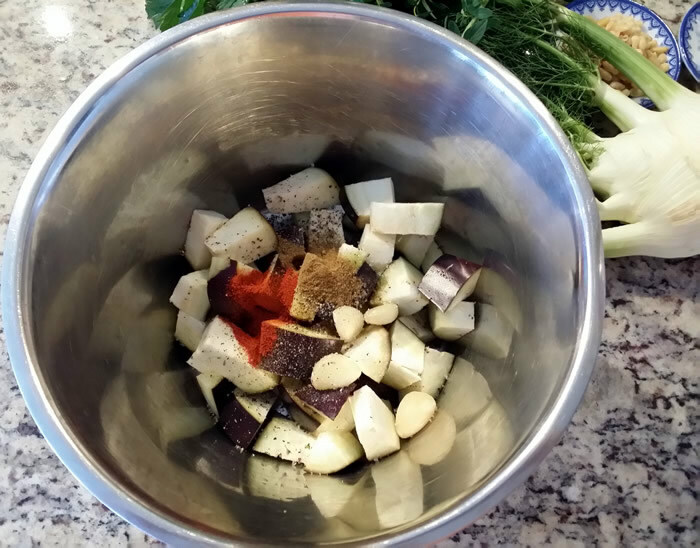 Mix the eggplant in a large bowl with ¼ cup olive oil, cumin, paprika and ½ of the salt & pepper. Make sure garlic is also coated in the mixture and set aside. 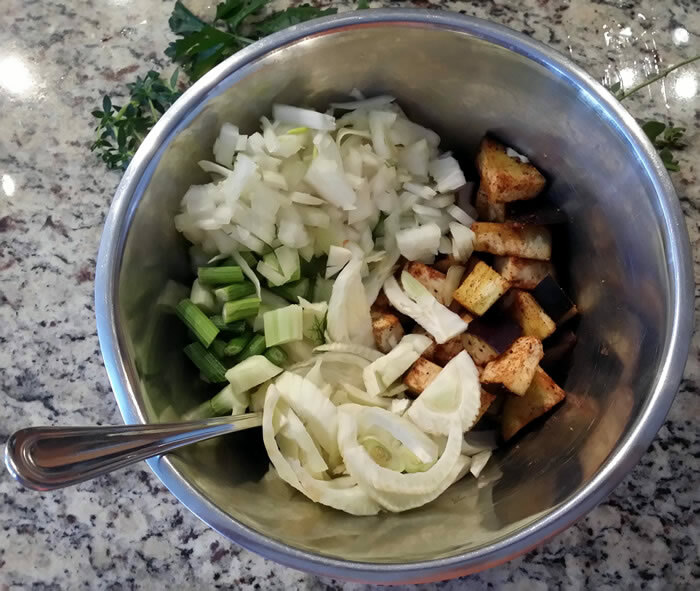 Add fennel and onion and another ¼ cup olive oil and mix together so it is all well coated. 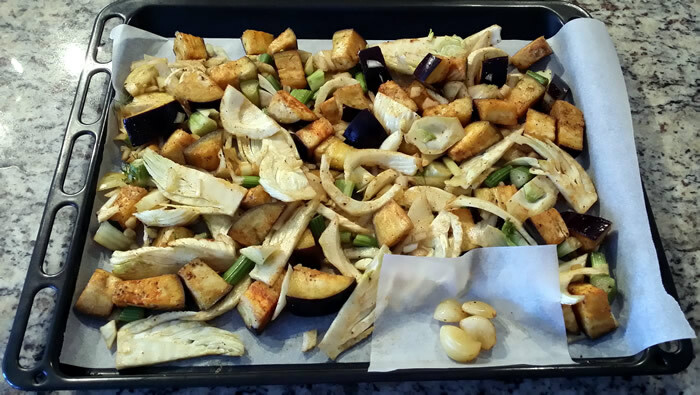 Line a large tray with baking paper and spread the vegetables evenly, with the garlic separated, and roast for 20 minutes at 200° C for 20 minutes, mixing/turning once after 10 minutes – take out garlic at this stage. 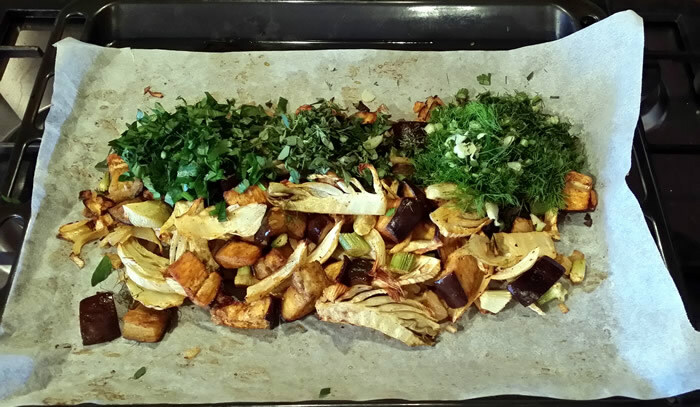 While the vegetables are roasting, chop the herbs retaining some for garnish. 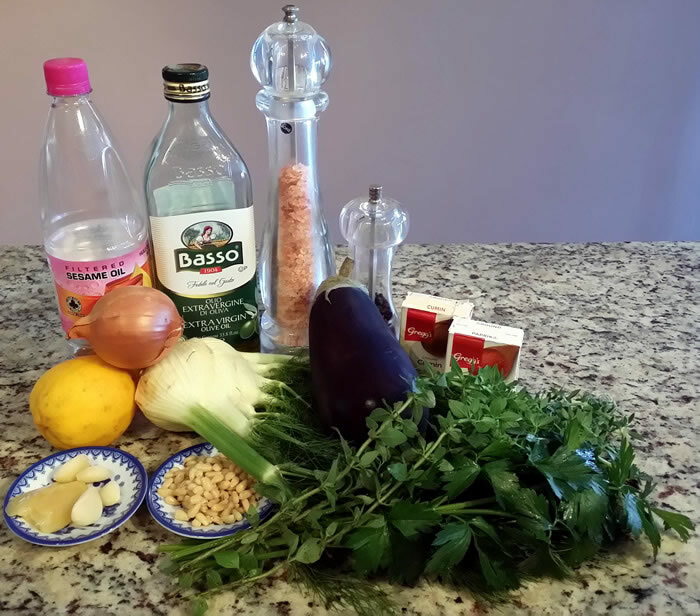 Use a bullet or blender to make the dressing using remaining ¼ cup of olive oil, lemon juice, sesame oil, remaining salt & pepper and the roasted garlic. When the roasted vegetables have cooled slightly toss with the chopped herbs. Add the dressing, mixing through well. 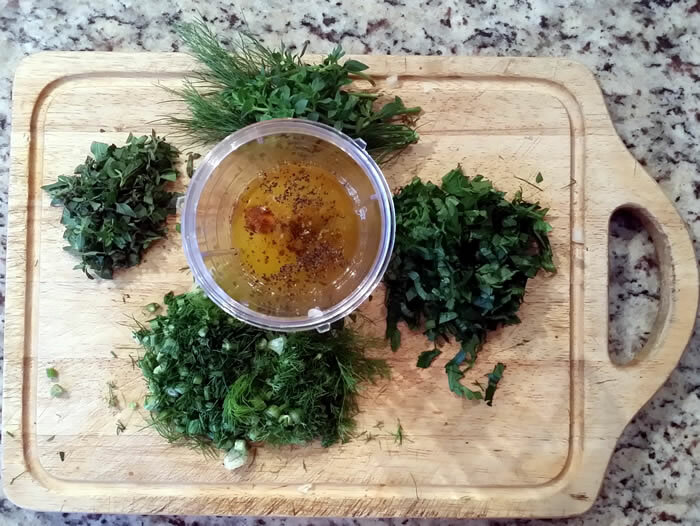 Garnish with fennel fronds and other fresh herbs and serve.